Creator of the Arlington Rap returns, but is he lacking an edge this time around? D.C.'s got its own Weird Al. Finally. "Even during the day, my Skins pride gonna linger. In social situations, I still wear my foam finger." Pottery Barn. Clarendon. The Green Line. And now the Redskins. Goodness, Remy, is NOTHING sacred to you? 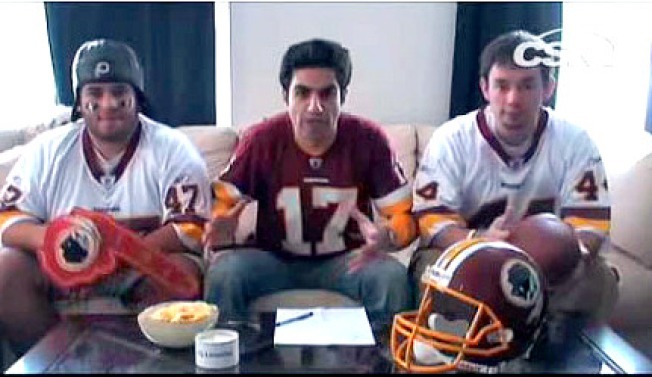 Local comedic rapper Remy Munasifi -- who exploded onto the scene in June on the strength of his Arlington rap -- debuted his Redskins rap on Comcast SportsNet over the weekend. Yes, he's movin' on up into the big time! No more YouTube premieres for this guy. The D.C. Sports Bog calls his new video "one of the best things to come out of Sunday's game." And considering the other results of the game (a close, boring win and some really teed-off tweets), you have to agree. After all, there's not much better in life than watching Remy try to call a pizza delivery place, and struggling to dial the phone since he's still wearing that foam finger. OK, Remy, you go do what you gotta do, but making fun of the Redskins might have been a tad more relevant. At least we'll always have Starbucks to mock.